I didn’t need to be asked twice when the opportunity to jump in on a ferry flight of Bell’s brand-new 505 Jet Ranger came up in late May. The new five-seat short light single fills the void in the Bell (note, just ‘Bell’, the company dropped ‘Helicopter’ from its name in February) product line left when production of the ubiquitous Bell 206B JetRanger, which dates back to 1962, ceased in 2010. Its successor features an all new five-seat cabin, Garmin’s impressive G1000H avionics suite and a 504shp Arrius 2R turbine – this is not your father’s JetRanger! I first had the chance to inspect the 505 at the Rotortech expo on the Sunshine Coast, where it was hard to escape the thought that it looks, well, different. I think it’s the combination of the shorter skids and downturned nose that somehow messes with what you expect a helicopter to look like. But, in my experience having spent some time with the machine, people warm significantly to it, and I think the challenge for Bell is to get the machines out for people to see and touch. The 505 that I had the opportunity to fly in was VH‑HRH, one of four 505 helicopters currently in Australia. Two are with Nautilus Aviation in north Queensland, one is in Western Australia and VH-HRH is a privately-owned machine based in Sydney. 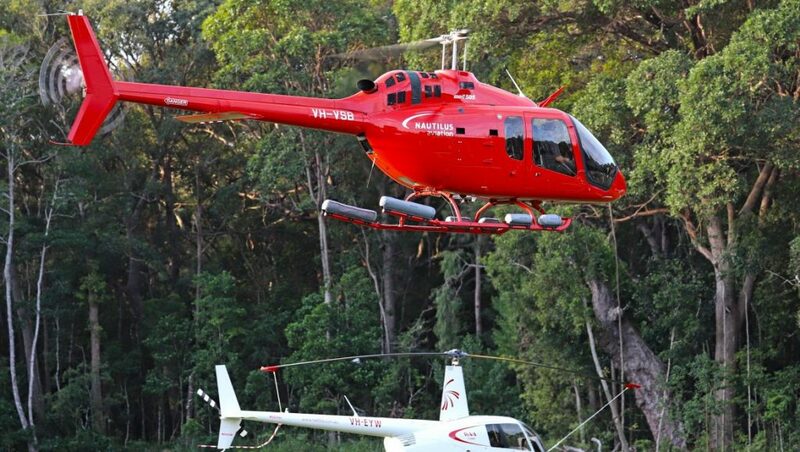 Another two are expected on the Australian register soon for 12 Apostle Helicopters in Victoria. VH-HRH was completed in December 2017 and it had just 26 hours on the airframe when Bell’s Australiasian business development director Daniel McQuestin had re-positioned it to the Gold Coast Airport from the Sanctuary Cove Boat Show, for our flight south to Sydney. New helicopter smell? Oh yeah! Apart from the new helicopter smell, my second immediate reaction to the cabin was, ‘thank goodness they got rid of the broom closet’. The biggest wish of any tour operator using B206s is to improve cabin room and visibility by removing the central control runs going through to the ceiling. Thankfully the 505’s cabin is a completely open space with its two+three seating configuration. Indeed the visibility is amazing. There is perspex everywhere. This is probably the feature that people will walk away remembering. Pilots and operators will spend a lot of attention going over performance figures and costs. But for the average passenger visibility is what they will notice the most. The windows come down to only a few inches off the cabin floor all the way around, while the rear seats are lifted up slightly above the seat height of the front seats, allowing those in the back a better view forward. The seats themselves? Well they are helicopter seats, so nothing to get too excited about. The Nautilus Aviation 505 at Rotortech had a more basic seat option, while our Sydney-based machine had an upgraded option with thicker padding in the rear seats and two-tone leather finish. The Bell website has a page where you can demo the wide range of seat colours available – black, black, tan and grey. No cherry red! But they certainly seem comfortable enough and I’ve got nothing negative to say about them from jumping out after two two-hour hops. The more utilitarian version of the seats can fold up to provide more cabin floor space. They also can be detached from the rear wall and will fit in the baggage compartment or left on the ground for a load lift if the weight saving is needed. Busy tour operations will need some vigilance to remind passengers not to put their bags and gear under the seats. It is a tempting space to put something out of the road but is needed clear for the seats to stroke down correctly under a heavy landing. 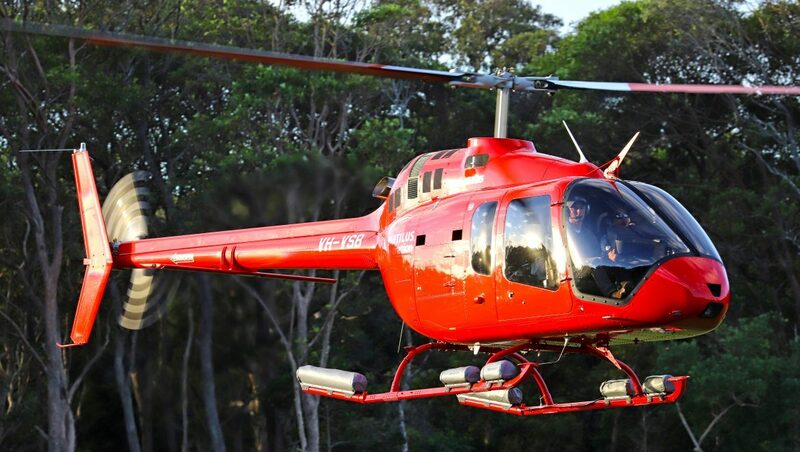 VIDEO – Hawker Pacific is the local distributor for the Bell 505. The forward seats are fitted on rails to move fore and aft, but must be in the full forward position for flight, with the pedals then adjustable for leg length. There is plenty of head room. From my time in the Army I remember a number of taller pilots scraping the ceiling of a Kiowa (the military B206) once they had their helmets on. No issues here. The only things mounted overhead are the fuel shutoff, rotor brake, a nav light, hooks for headsets and the airconditioning vents. Surprisingly, the cabling for the fuel shutoff and rotor brake and electrical wiring is exposed in its roof slots. For passengers sitting in the rear seats this is probably masked slightly by the aircon vents blocking their view of it, but it does detract from the feel of the aircraft finish. The bolt heads on the roof holding the upper hydraulics cowling on are plainly visible and there is no cabin carpet or noise insulation material to finish over the bare cabin frame roof as a standard Bell fit as yet. The cabin floor is completely flat. The one we flew had a locally manufactured carpet inlay added after purchase. The more utility version seen at Rotortech had a bare hard deck floor with a very military look and feel to it. The only fittings to break up the flat deck of the cabin are the seat rails for the front seats, dust/FOD boots of the collective and cyclics, a flight manual/map storage holder, the FRAHM vibration box between the seats and a small fire extinguisher. The main cabin doors are monsters compared to the older B206 design, with the one door for access to both the front and back seats. But from the front seat you don’t have to reach right back to be able to operate the internal handle, instead there are two internal latches to open the door. For the front seat you reach back level with the rear of your seat and the passengers have another one further rear again that is easy for them to reach. The doors need a pretty firm pull or a bit of a swing to get up the inertia to engage the pins. The top locking pin at the rear of the door has a white visual mark to indicate if the latches are fully in. Some neck twisting from the front seats is required to check that latch as it is a long way back. The amount of visibility out the door’s huge window is fantastic with it coming down to only a few inches off the ground. The door mounts and gas strut look fairly sturdy but the doors have so much surface area that I would be concerned in stronger winds or if another machine was landing anywhere nearby. I should note I have a few concerns about how I would go in a water ditching situation from the front seat in the 505. These mainly centre around the size of the door and the forward seat position. There is no door jettison function to pop the doors prior to entry or during the initial escape, and the size of the door could make it difficult to force open against outside water pressure pushing against it. The door opening latch is not in the position it is in many aircraft where you can slide your hand almost directly sideways and find it – you do have to reach backwards and down to actuate. I would want to sit there and practise to build up some muscle memory. Sliding your seat rearwards to exit would also be an important part of practise drilling to provide a bigger space to pull yourself through. Sliding the seat back would also help with locating the door latch. Meanwhile, the rear of the cabin has a quarter door or clamshell door on the left side only, which can be swung out and rearwards to provide full access right to the back wall of the cabin floor for bulky items. Behind the main cabin wall is a 18cu ft (0.5m3) baggage bay, accessed by a 56cm (w) by 42cm (h) door, just big enough to sneak in a large hardshell suitcase. It affords a pretty big continuous volume, which is important given the warning about using space under the rear cabin seats with passengers. But there is no access to the baggage area from inside the main cabin. The rear cabin wall is a structural item which the passenger seats hang off and it looks like the designers have left it intact rather than have that internal/inflight access to the baggage area. Finally, you can dial your baggage weight up on the Garmin 1000H and it will calculate centre of gravity (CoG) – more on which later. The lighter weight of the 505 slung under the LongRanger’s blades provides a reduced disc loading. In terms of flight characteristics rotor inertia and tail rotor authority is similar to current model LongRangers. The completely exposed tail rotor gearbox looks out of place with the rest of the helicopter, even if passengers are unlikely to notice and it does make inspection easy. And Bell does have an aerodynamic tail cone kit in development. The 505’s vertical fin looks identical to the current 206L4’s, while the underslung-mounted horizontal stabiliser was arrived at after a number of positions were trialled during testing. It does look like an afterthought but no doubt it is easy to fit and remove and there are no spars protruding through the tail boom. The horizontal stabiliser’s reverse aerofoil design, like in almost all helicopters, produces a downward force on the tail in forward flight resulting in a more level attitude and increased forward CoG range. It has a slotted leading edge which is a new feature to the Jet Ranger design which acts to delay airflow separation at higher angles of attack that the horizontal stabiliser might experience in a climb. The other notable tail section hardware feature is the vibration dampening counterweights. These are square plate weights mounted to the end of the tail boom with a stiff wire coil bracket that work to dampen airframe vibration. This would also be the attachment location for any ballast weights and being so far back on the tail allows for very small weights to be used to adjust center of gravity. The skids and crosstubes are pretty standard construction. The skids are comparatively short while the toes canter in a little at the front as they angle up and are topped by a flat step to assist with entering the cabin. The Nautilus-owned Bell 505 on display at Rotortech was fitted with popout floats and the rear skid extension, which gives the skids more ‘normal’ looking proportions. A high skids option is expected at the end of 2018, which will provide another 15cm of lift. From the pilot’s seat the toe ends are behind your seating position – in line with the rear of the front seats. To see them in the hover requires a small head tilt outboard and a glance slightly rear. 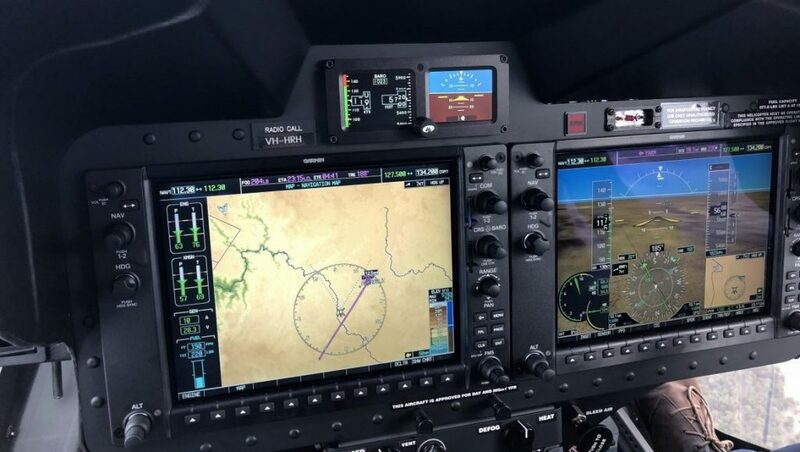 Getting started and going is very simple, thanks to the Garmin 1000H multi function displays and the Safran Arrius 2R’s dual FADEC (full authority digital engine control) system. Once power is on the G1000H takes about 10 seconds to complete its internal boot and system test. Then the next step is to enter passenger and cargo weights into the weight and balance page (it pulls in fuel quantity from the fuel sensor). This page is very similar to a number of mobile or tablet apps which allow you to wargame different loading configurations vs CoG and AUW limits. After a control check and clearing the area starting the engine is just a matter of selecting the engine switch to on. From here the FADEC takes over with no pilot input needed – fuel introduction, throttling, hot start shutdown are all handled by the system. The engine start takes approx 40 seconds to idle. If it is a consecutive start after a short stop then the FADEC will motor the engine if needed to cool before igniting. There is a small amount of ground bounce evident that is cleared by pulling in a little collective or repositioning the cyclic. With hydraulic control checks out of the way you then select ‘fly’ with the thumb switch on the collective head. Five seconds later you are at flight RPM. I was able to learn more about the 505’s FADEC setup after a subsequent chat with Alan Whitten, a field rep for Safran Helicopter Engines Australia. He explained that the dual channels are continuously online, and that at each consecutive start the primary active FADEC alternates. If a start cycle fails to complete for any reason and is aborted by the system then it will automatically go for one more start attempt before calling it quits. In the event of the active FADEC channel suffering a high or low side failure the changeover to the standby channel is almost instantaneous and no RPM change would be seen, Alan indicated. Surge and flameout protection is handled automatically by the system but it won’t limit fuel on the high side to protect the Arrius engine – if you keep demanding power above the published limits then it will keep trying to match should you decide that’s the most important thing at the time. I loved the checklist actions for an inflight restart: bleed air (heater) – off; throttle switch – fly; engine switch – off; then back on again. Simple. Engine shutdown is on a 30 second idle cool down timer and ‘OK for shutdown’ is displayed on the MFDs to let you know when you are good to select the engine to ‘off’. 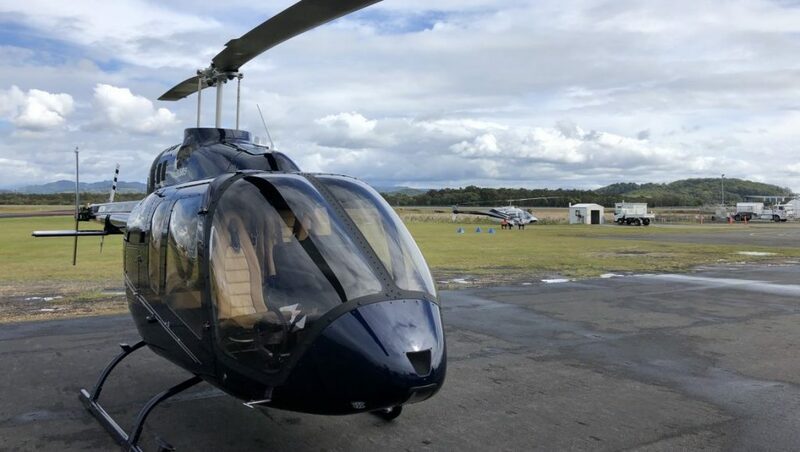 Transitioning to the G1000H from steam-driven cockpits will be the main gap training required for many Australian pilots given our aged light helicopter fleet. The aircraft is quite straightforward but the multifunction displays are a big jump from the B206 (even if the G1000 itself has been used in the fixed-wing world for over a decade!). The right hand display was set to show an artificial horizon above a horizontal speed indicator with airspeed and altitude ticker tapes to the side. This was overlaid on top of a 3D terrain representation from a map database which gives a ‘synthetic vision’ (an optional upgrade) look ahead of the aircraft. Looking between the terrain in front outside the aircraft and at the graphical representation it matches it very closely. The left hand display was set to the engine page most of the time providing a large digital representation of a power gauge and rotor RPM. Power is displayed on the digital arc (power situation indicator) as per cent with 100 per cent being max continuous power and then a yellow arc showing five minute takeoff power range. As soon as you pull into the yellow a timer appears showing the elapsed time in the arc. Torque, MGT (measured gas temperature) and NG figures are shown with a green box around the current limiting parameter. The power display smoothly blends between whatever is the engine limiting number at the time, making power and engine management incredibly easy. At other times in the flight we used the map mode to skirt around Evans Head and Williamtown airspaces, pull up airfield frequency information, look at weight and balance scenarios and used the terrain database to visualise higher terrain ahead. Future versions will have external data capability to pull in weather. It almost feels like cheating after coming from older machines when the MFDs continuously display your fuel burn, expected landing fuel in lb, expected landing weight and the fuel margin. But I’m not complaining! Finally, a radar altimeter is another optional extra that is available but not fitted to this 505. The collective head is a very simple affair. It has the two position throttle switch – idle/fly – and that is it. The cork looking handgrip where the throttle normally would be located is purely a handgrip and doesn’t twist. The cyclic heads on this machine just had a ICS/radio trigger and on the right hand side a TCAS warning cancel button. Hook or float-fitted machines would have their appropriate switches modded on. The controls are… well… firm. You can release your grip on them and they don’t feel like they are going to move away (yes – friction was off). They are noticeably firmer than anything I’ve flown before. It is not that they are hard to move but you do have to push it to make an input rather than using your fingertips (cyclic). In cruise I would sometimes get into a wallowing motion in roll where I was looking for that middle position but just overshooting each time. Similarly with pedals vs power changes there is not a lot of control feedback through the feet. There were times I was still overshooting for balance or not putting enough pedal in even approaching Sydney at the end of the day. I’m sure you would get used to it and it makes for a stable platform for the most part. I just wouldn’t mind a little bit less resistance. As a counterpoint, a pilot that jumped in at our transit point of Armidale apparently had no problems keeping it in balance, so maybe that just talks to my skills! But a Nautilus pilot confirmed the stiff control feeling in its 505s and in the machines used at the Bell factory course. There is no cyclic trim motor, the firmness of the controls masks any pressure that you would need to trim out is my guess. Dan indicated an autopilot is a future planned option. I didn’t fly in the hover or make any of the approaches so I can’t talk to those regimes but in flight it handles pretty standardly as far as rates of roll, pitch and yaw go. Dan demonstrated a practice forced landing prior to arriving at the Armidale circuit. Again it feels pretty standard for a B206 with auto speeds in the flight manual of 60-70kt. Entering auto is done by selecting the throttle switch on the collective to idle. There is a fair displacement of right pedal needed in the entry, and I didn’t see what the rate of descent stabilised at. As it is a B206L4 drivetrain with a lighter helicopter underneath the autorotation characteristics should be quite docile. In our case switching the throttle back to ‘fly’ joins the needles in about two seconds and Dan climbed away. The stop at Armidale provided a chance to see the 505’s power margin at work, given Armidale is Australia’s highest city airport at 3,556ft elevation. Temperature on the ground was 13 degrees and the locals had much thicker jackets on than the one I brought with me! With full fuel and four POB the aircraft was approaching maximum all up weight. Dan pulled into a vertical climb at max continuous power and was holding 1,000ft/min on the VSI before transitioning away several hundred feet above the field. Departing for Sydney again with full fuel but just the two of us onboard we again easily climbed vertical with a left pedal turn at 1,000ft/min climb using less than max continuous power before transitioning to forward flight on track. A frequent point of debate in online forums is the published VNE of the 505 and whether it is an aspirational marketing figure, how bad vibration is at speed, what people will normally cruise at and the fuel burn at speed. It is certainly very easy to get close to VNE with full fuel and two people onboard without pulling above MCP. The G1000 calculates VNE on the fly depending on outside pressure and temperature. For us it ranged between 134-128KIAS on the flight. This is displayed on the IAS ticker tape as a red line and the airspeed text turns yellow as you approach it. This aircraft was fitted with an (optional) FRAHM vibration dampener between the front seats. This is a sealed black box with spring loaded weights that acts to dampen – as the name suggests – inflight vibrations. It can be removed for a 12kg weight saving. As you increase speed above 115kt towards 125kt+ there is definitely an increase in vibration. But it is no way a limiting factor that would make me want to back off for that reason. You can still hold and read a map and write without any issues. Holding a pen by the tip horizontally against the cowling you can see it bounce at the other end. If it wasn’t VNE-limited at that point you would comfortably be able to fly faster in terms of vibration. It is still slippery at that point too with even a small rate of descent sliding the speed up towards the limit. I forgot to check the amount of forward cyclic travel remaining, but it didn’t grab me as an issue. In terms of hard figures – 20mins out of the Gold Coast airport on track to Armidale at 2,000ft (QNH 1024, 15 deg OAT and 1,422kg) we had 115kt IAS at 210 lb/hr fuel flow. Dropping that to 113IAS gave us 200lb/hr. Dan suggested that most people will aim around the long-range cruise of 113kt IAS and 200lb/hr for flightplanning. The AH showed a pretty steady negative 2.5-3 degree nose pitch for all the cruise flight we did on the day. The cabin feels flat and level in cruise even at the high end of the speed range (front seats have a slight rear tilt while back seats are mounted vertical to the cabin rear wall). Our ETA into Sydney was starting to approach last light and we had a significant fuel margin so for the last 20 mins of the flight we comfortably sat at 125kt IAS along the coast below 1,500ft with a 250lb/hr fuel flow at just below max continuous power. Vibration was nothing uncomfortable and I really only mention it to address concerns that people had. Using the above figures you can do some quick calcs to come up with a 2 hour 23 minute endurance with 30 minute reserves and range of 270nm. Dan expects a future aux tank for the cargo compartment will give around another 30 minutes of fuel. Using VH-HRH’s flyaway weight with optional extras (AC, leather seats, avionics upgrade, Frahm vibration kit, rotor brake, second VHF radio and aftermarket carpet floor) and at full fuel of 262kg there is 733lb or 333kg of internal payload. Lifting with five people at 90kg each would see you dropping fuel down to 60 minutes cruise + 30 minutes reserve. Any sling ops are going to be with the left door off as there is no bubble window fit. I am not sling-endorsed but I can’t see any issues with looking out and down. There is no chin bubble for those used to looking through that for a mirror for hook-up. The mirror add-on kit was not fitted to our machine but mounts to the side of the frame abeam the tail rotor pedals looking rear and under. The hook is rated for 907kg. When loading externally the MAUW increases by another 360kg. Seats and doors can be quickly stripped out to reduce weight onsite. And to achieve the max-rated load of the hook on a one-off lift you’ll need to strip as much as you can and be on a minimal fuel load. The 505 isn’t alone in that regard. Taking HRH’s figures above completely as is, full fuel, an 80kg pilot and discounting any weight for cargo hook fittings (333kg payload – 80kg pilot + 360kg external MAUW increase) give a 613kg lift. Then start stripping equipment and fuel out for extra realism. The outside of ground effect hover ceiling at max external gross weight of 2,030kg is approx 3,500ft at ISA conditions at takeoff power (5 mins). The 1,000ft/min vertical climb out of Armidale at close to max internal gross weight (1,670kg) with max continuous power is at least promising in terms of the extra power margin still left. Dan indicated that a NZ operator conducting fertiliser spreading operations has set its aircraft up in a utility config and is regularly lifting with 725-775kg external loads and have gone up to 850kg on the hook. 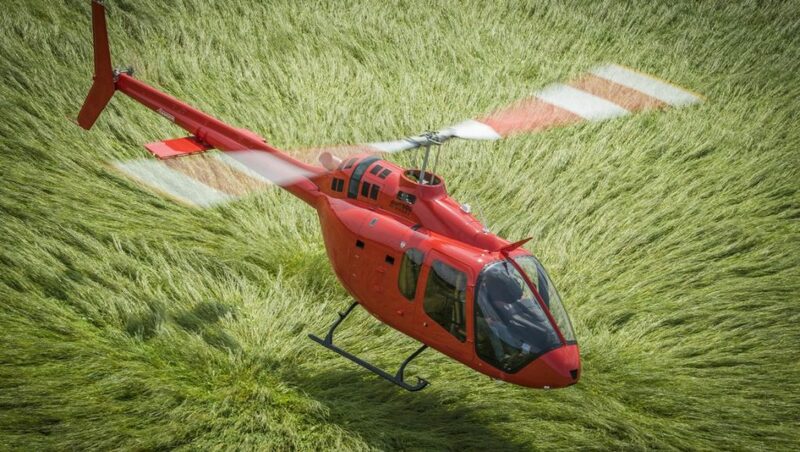 The upfront cost for a Bell 505 including normal options for Australian customers and conditions and which includes one week of Bell factory pilot training will see you looking around the US$1.5 million mark. Bell sales material includes an operating cost table showing a US$441.14 per flight hour running cost. Conklin and de Decker’s Aircraft Cost Evaluator puts it at US$472 per hour, compared to US$588 for a Bell 206L4, US$628 for the Airbus H130, US$494 for Airbus H120 and US$377 for the Robinson R66. Bell offers OEM Standard and Premier maintenance care plans which push the 1,000hrs/3yrs warranty out to 2,000hrs/3yrs and include such things as priority access to parts. 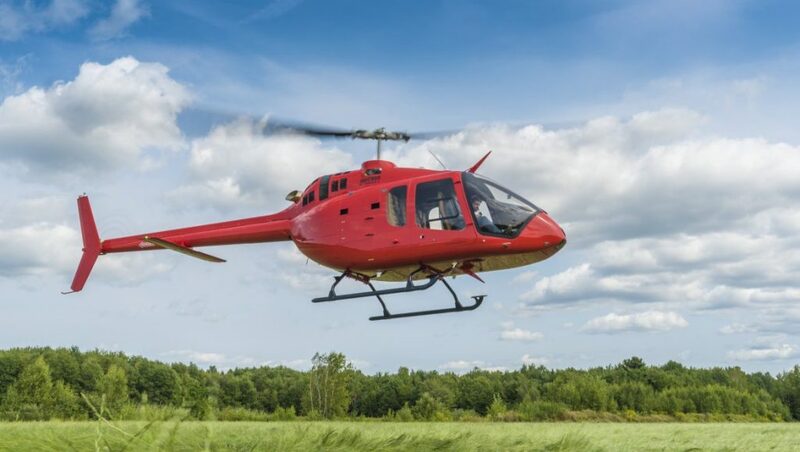 On the Premier plan one of the advantages is that Bell will send you the parts for a scheduled servicing in advance based on your flying rate to minimise downtime. Major component times are listed in product specs for the Bell 505 and available off the website. Component times are still part of a Lead-the-Fleet extension program and as flight hours are accrued on the Bell training aircraft (likely to be the highest hours) and fleetwide, then additional life may be added to components. Routine scheduled maintenance includes a lubrication servicing every 50 hours and inspections at every 100 hours. What a great way to spend the day by flying down the east coast in a brand new helicopter and learning more about it on the way. The 505 is a very nice update to the Jet Ranger family with some major standouts. The huge amount of perspex all the way round gives a sensational unobstructed view paired with the open single area cabin. The fifth seat helps a lot with tours and charters in keeping couples together. The dual-channel FADEC is turbine engines on easy mode. It is going to be great for private pilot owners and low-hour tour pilots. Hopefully there are lower insurance premiums or minimums that flow from this. Having the one power gauge that incorporates multiple limits frees up a lot of attention too. The additional 360kg maximum external gross weight increase means that when you are operating at the lower internal only gross weight there is going to be an excess power margin available at Australian elevations. The new external cabin shape and short skid combo will still be a talking point for a while. How much it matters to prospective passengers or if they will care is debatable. For industry types I think once more are flying in country and people get to see them more often that the cabin shape will become more familiar and normalised. I’m not at this stage a fan of the stiff control feel but that might be something you get used to with extra time in the seat. I’d jump at the chance to get another flight and it’s great to see more technology find its way into smaller helicopters in an age of smartphones, self-landing rockets and electric cars. If you see a 505 landed somewhere near you, you really do want to make the effort to go take a look inside.